The idea of planting strawberries on a farm was it was early money. And, of course, back in those days, early money was very nice to have. It was one of the first crops you could harvest first of May. Consequently, most all farmers had a patch. We called them “strawberry patches,” but sometimes it would be three, four, five acres, maybe even as much as ten acres. 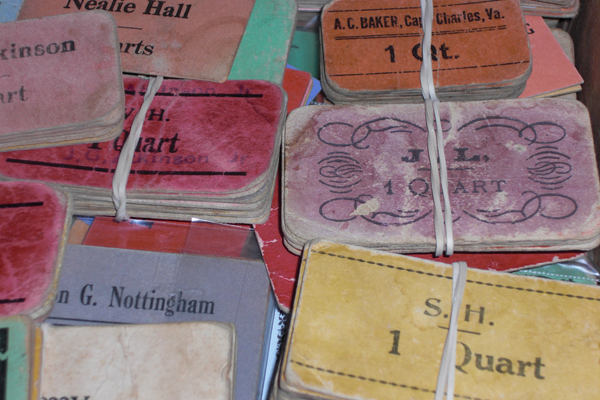 (As a matter of fact, a hobby of mine is collecting [local] strawberry tickets from back in those days). … I’d go up on my bicycle to the field and pick until school started, and right before school started, my mamma would come pick me up and carry me to school. And then, in the afternoons when I got home from school, took care of my chores, took care of the chickens and the eggs and everything, I’d go back and pick some more for the next day’s picking. We had what you’d call “strawberry flats,” and when you carried them up to what we called “strawberry bowers,” where the ladies packed them, so when you opened the crate, there were all these pretty berries on top. You didn’t have any ugly berries … because they were always thrown away. Depending on how many quarts you had on that flat, you were awarded thses tickets, and it could be one, two, five, ten, twenty-five, fifty or a hundred. Of course, the twenty-five, fifty, a hundred, they would be awarded to a fast picker who … you knew was going to pick that many in a morning’s picking, so rather than give them all these individual tickets, you’d just wait until they brought twenty-five, [and] give them a twenty-five strawberry ticket. Of course … they kept them. And then either on Friday afternoon or Saturday morning, they’d be paid off, if you had a hundred – let’s say you picked a hundred quarts that week … they paid ten cents a quart, you’d end up with $10 for your week’s work … which, back in those days wasn’t a whole lot of money, but it was more than some money, so to speak … and a lot of people would pick a hundred, a hundred fifty in one morning without any problem, even two hundred, a good fast picker. Those strawberries were carried by truck to what they called auctions, strawberry auctions. … We had one here in Exmore, and used to have one in Painter, they said. I don’t remember that one. We always carried ours to Exmore. from an interview with Winter C. Cullen, III, fall 2009.